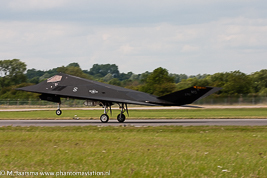 The Lockheed Martin F-117A Nighthawk became the first stealth fighter. It saw action during the Gulf War as well in Serbia were one was downed by a Serbian Air Force air defense missile. Parts of the aircraft are on display in the aviation museum in Belgrade. F-117A taking part in flying display RIAT 2004 at RAF Fairford.